Cut each mushroom into four pieces and keep it aside. Chop spring onions and keep the green parts and white parts separately. Boil cashew nuts in little water for 5 minutes and grind it to a paste. Heat oil in a pan, add chopped onions and white parts of spring onions and saute till brown. Add chilli powder, coriander powder, turmeric powder, cumin powder and salt and saute well for few minutes. Then add chopped tomatoes, mix well and saute till soft. Add ground cashew paste and stir well. Add chopped mushrooms , mix well and cook for 5 minutes. 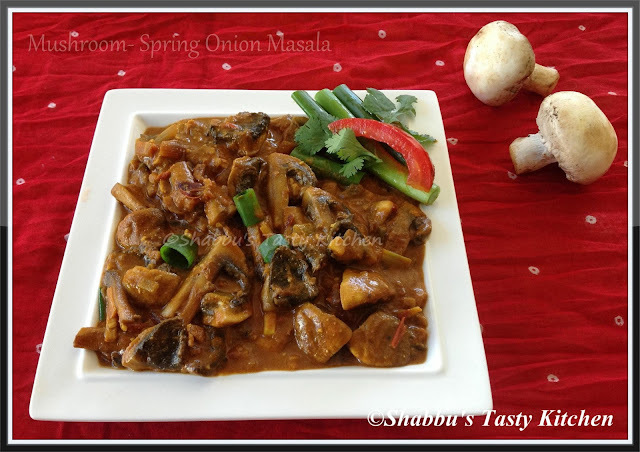 Mushroom curry looks truly delicious !! Looks so tempting and delicious!! I love mushrooms! The combination is good ! Lovely gravy. Inviting Masala,wish i live near you. Perfect! !I would be trying this soon.